Projects in which time and cost are fixed and scope keeps changing, we need to be sure that team performs well and delivers a high-quality product on time. Senior Managers of the company needs to make sure that team uses right methodology, right practices and work smartly rather than slogging. Fortunately, gone are those days when waterfall methodology was used in almost every project and team members worked day and night to complete documentation for the project. Now, most of the companies have switched to an agile – iterative and incremental methodology. Teams spend time on producing quality work rather than creating more quantity; documentation is done only when its is absolutely necessary to maintain the records. Time is saved, cost remains under budget and teams keep buffer time period in case of new or unknown requirements come up at any time during the course of the project. Let’s take an example of a large scalable project which is running on a tight schedule, with a small and distributed team, unstable requirements and the team does not have prior experience in developing large scale software. Which methodology team must pick, so that they use only those practices which will boost the development rate and deliver a good quality product on schedule without wasting time on unnecessary work? In this scenario, if we select a hybrid methodology such as Scrum and XP, it might turn out to be the best solution. As we know that XP is an engineering methodology that has various practices to ensure dedicated, centered and high-quality code. There are few practices out of all XP practices, that will be appropriate for such type of project. XP’s ‘Test Driven Development’ practice ensures that developers understand all interfaces and expected functionality of a class before actually start coding and ‘Continuous Integration’ ensures that code that is written gets automatically checked out, gets built and runs a library of predefined tests. By using these practices, the development team will be able to build a high quality and stable base for the software to be developed. ‘Simple System Design’ practice of XP will ensure that team designs only what is needed to support the functionality being implemented, which certainly will help the team to deliver the product on time as we know that it’s a time-boxed project and they have only limited time to launch the product. If the team is experienced in creating small-scale products, they can create a prototype and get it verified from the customer in early stages of the project. It will help them in creating a stable base for the desired product, which they can use it to develop the entire product. To achieve this, using XP’s ‘Refactoring’ practice will be most beneficial because it will allow them to improve the existing design and class structure to support the currently listed functionalities as well as for future requirements. Hence, making it a scalable software, which is one of the project’s most needed requirement. Moreover, we also know that scrum consists of practices which are specifically used by management and customers to increase the value of development effort and maximize team’s productivity. Therefore, it will definitely ensure that all of the practices are followed religiously in a project and team delivers a high-quality product on time. 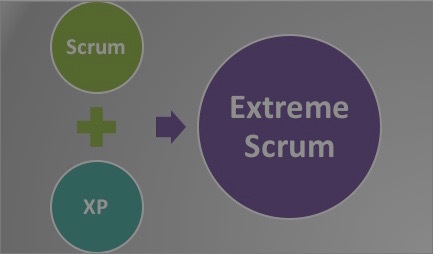 Now we know that both Scrum and XP consists of unique practices that are suitable for a time-boxed, fixed cost, and variable scope project. When practices of such methodologies are combined for any project, we get a hybrid methodology. Management can select only relevant practices suitable for the project which makes it easier for the team to focus on creating high-quality work rather than worrying about unnecessary work. This makes the team work flexible and open to accept changes or new requirement from the customer at any time. To conclude, a hybrid agile methodology that is tailored specifically for a project – makes the process of improving productivity and maintaining quality easier than non-hybrid projects.